How achingly alive they are, these people who insist that they have never really lived. When popular, puffed-up, and aging actress Arkadina returns with her younger lover, a fashionable writer, to her lakeside estate in late 19th-century Russia, she steps into a bees’ nest of would-be artists and jealous rivals — or at least as one critic put it, “a Petri dish in which frustration mutates and multiplies.” She also enters a musical chairs game of unrequited love. Medvedenko the schoolteacher loves Masha, the estate manager’s daughter, who pines for Konstantin, Arkadina’s playwriting son, who lives and dies for the ambitious ingénue Nina, who seduces the self-reflective author Trigorin, who is smitten by Nina but smothered by Arkadina. The worst is that all of them know all of this, yet they more often spend their time batting at flies (and then humming and singing for attention). The doctor, Dorn, is handsomely fit but detached; Arkadina’s brother, Sorin, is burning with zeal, but ill and effete. Time ticks slowly, and yet slips away as each one pinches it in fits and starts. I had to complete two-thirds of the journey through the forest, by moonlight, and my state of mind was extraordinary, such as I’ve not had for a long time; it was as if I were returning from a tryst. I think that proximity to nature and idleness represent the vital ingredients for happiness; without them it is impossible. His grandparents and great-grandparents had lived in the countryside, and he felt his roots there, but he also made his own new contributions: a post office, a bridge, a paved road, a fast-train stop, and three schools, let alone his work to fight cholera and give free medical care, signaled by the red flag he put up on his dacha in the garden on the days when he was a doctor more than a writer. This guest annex, or Flügel, was the result of his frustration over the steady stream of live-in visitors to Melikhovo, spilling over into the barn at times; so the little two-room cottage with its balcony view to the endless trees and flowers he planted usually accommodated none other than he himself. It was there, more or less tucked into the woods, that in the summer of 1895, he wrote The Seagull. The ladies had a way of finding him, especially the talented Lidia Mizinova, whom he adored as did his whole family, but ultimately she gave up on him and began an affair with a married friend of both of theirs, the writer Ignaty Potapenko, who wouldn’t leave his wife after Lidia became pregnant and instead dropped his relationship with her. A gifted musician who aspired to become an opera singer and actress, “the fair Lika,” as the Chekhovs called her, never reached her dreams but she did fill the pages of The Seagull as Nina Zarechnaya, and she was in fact one of the few people Chekhov sought out after his dismal failure with the first production of his play. On the first night of a new play, he was always terrified of how the audience would react. It was like stepping in front of a bear, he once said, except that an audience was more frightening. After the designated nine days for rehearsal time, Chekhov was horrified to see that some in the cast had not yet learned the lines and that one of the lead actresses, refusing to play the role, had to be replaced. Ill prepared for the play’s sophistication and depth, the actors lost confidence on opening night and fumbled as the audience immediately reacted to inept-looking stage sets. By the first monologue, the restless buzz was dotted with outright jeers, and by the middle of the play, Chekhov was out the door. The nuances of his irony and parody, lost on ticket holders looking for light amusement, were no more appreciated on an 1896 magazine cover that portrayed him riding a seagull over a marsh as hunter-critics took shots at him. Well, I’ve already finished the play. I began it forte and ended it pianissimo against all the rules of dramatic art. It’s come out as a story. When two years later in 1898, Vladimir Nemirovich-Danchenko and Konstantin Stanislavsky launched the Moscow Art Theatre and seized upon The Seagull for its inaugural season, they cast Olga Knipper as the older actress, Arkadina. If with Lika it was a case of Chekhov’s art following his life, with Olga it was life following art. 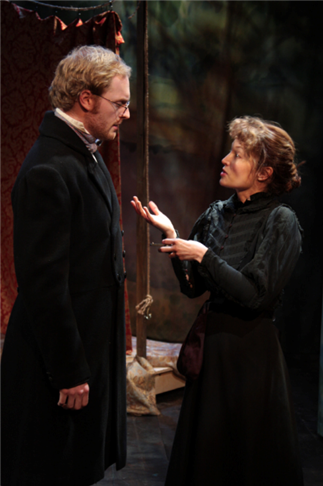 Chekhov met her for the first time at rehearsals for his play, and she became the love of his life. 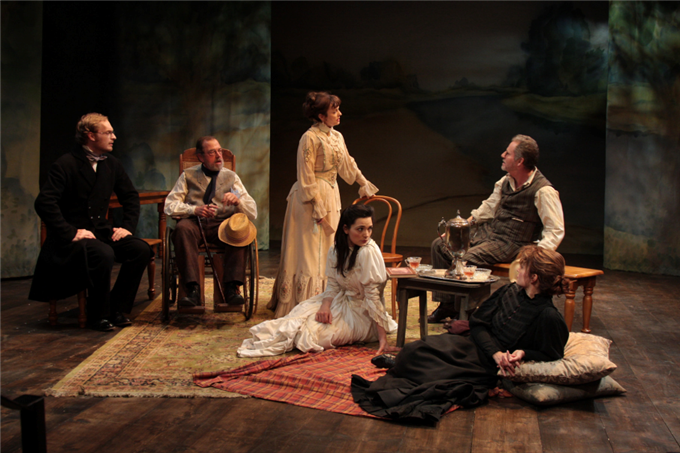 As for the fate of that second production of The Seagull, the three performances when it premiered were a complete sell-out. (Could it be owing to the fact that the actors, nervous about the opening night, had downed heavy doses of valerian?) Chekhov’s sister in Moscow, Masha, wrote to him in Yalta in 1899 that she could hear enthusiastic voices carrying on at one in the morning as people walked past her house after the theatre. Following the first act and then again after the third act, the audience had called out for Chekhov in the theatre, and when it was announced that he wasn’t there, they shouted, “Send him a telegram, then!” When he returned for the first time to Moscow after moving to Yalta for health reasons, the Moscow Art Theatre staged a private command performance of his play especially for him on May 1st. He had finally found a theatre company that was able to grasp and appreciate his goals as a dramatist. Today, after more than a century of realism in the theatre, it might be a stretch to imagine the impact of that new approach. House lights were no longer kept burning throughout the play’s performance (to allow attendees to gawk and peer at each other amidst the gilt and velvet of the auditorium’s décor); only the stage was lit, forcing the eye and the imagination to dwell on the characters and their setting. A new method of presenting the drama as the work of an ensemble called for intense rehearsals for crafting a mood. 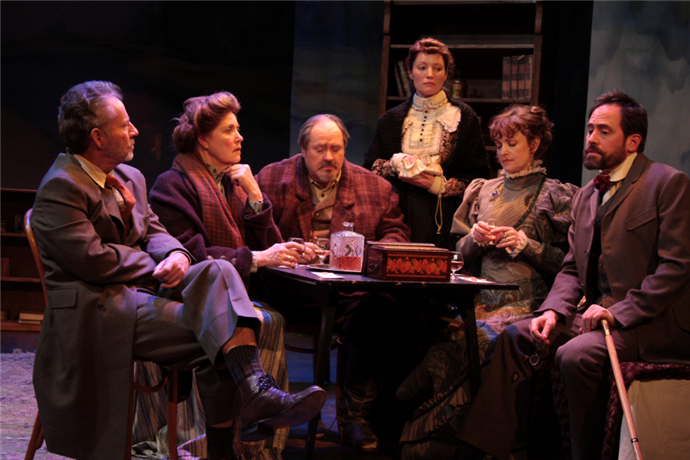 The staging was now conceptual, and the director interpreted the atmosphere envisioned by the playwright. A night at the theatre rewarded serious attention. And with this, the box office success of The Seagull (the new company’s sixth production) saved the Moscow Art Theatre from financial loss in its first season. The real reason he staged this production and asphyxiated us with sulfur was not to make a joke, but to give us an object lesson… He wanted to teach us how to write and to act. This is starting to get tiresome. Consider the challenges Chekhov posed in light of the Antaeus Company in North Hollywood, a growing theatre cooperative under an interim triumvirate of leaders that guides its own creative team and ensembles of actors (each production has two casts playing in rotation with each other). Dedicated to performing the classics of world drama, and at this time operating at the little theatre venue of Deaf West, the Antaeus has its limits: the stage is small and narrow and the seats are close enough to see the expressions on the actors’ faces and hear their whispers. Both can be advantages. Actors may enter and exit from the doors or aisles, transforming the entire house into a theater. Silences can be unusually penetrating. 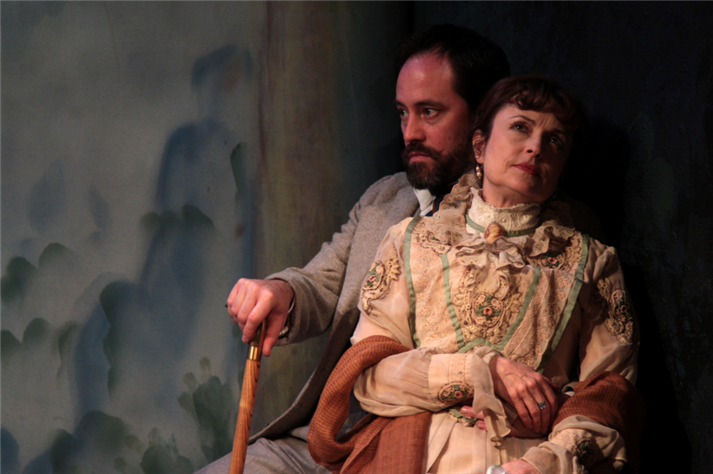 When director Jeanie Hackett put four of the playwright’s dramas together (with Act III from each) for one of the “Flights of Fancy” in the Antaeus ClassicsFest 2011, the energy, wit, and humor of Chekhov: The Third Act Project ran so high that it was difficult to choose a favorite act or play. Two decades ago when Antaeus mounted its first production and gave Chekhov’s The Wood Demon new life at the Mark Taper Forum in Los Angeles, the result was mesmerizing and unforgettable. The whole house was a dark forest with glades of green flickering in the leafy shadows on the stage. The characters seemed to have sprouted up from the very wood of their platform, organic, enigmatic, one more arresting than the other in an ambiance fluttering in motion. That ethereal, ephemeral world might once again be achieved with utter minimalism by the Antaeus Company, but the effect is hard-won in Lechetti Design’s concept for The Seagull, where a draped proscenium of aquarelle trees dwarfs the acting arena and competes with the make-shift stage that Kostantin erects for his outdoor theatre. That trestle stage, in Chekhov’s written directions, was simply a dead-center eye to the bewitching lake, luring spectators down the path to the shimmering waters that the overzealous young playwright ironically blocks with his platform; but here it’s pushed off to the right and sloppily covered with garish red brocade that clashes with the busy oriental carpet (and later, yet another red rug on top of that) presumably covering the “ground” where this ad-hoc audience sits. The color schemes roar, the detail distracts, and any lighting potential is lost in the clutter of what should be (and could be, on the earthy wood floor of this stage) a pristine, natural habitat for a core of intimately related characters. A. Jeffrey Schoenberg’s costumes are stunning, particularly Arkadina’s aqua and emerald coats on cream dresses and white voile and lace blouses, or her trim peach suit and silk skirt, all of which are key to the persona of the grand dame, but not when her hat falls off so many times in two minutes (in the Roubles cast) that it’s clear the multiple ways of retrieving it (by herself and also others) were not part of the plan. The woods belong to Konstantin, his private splendor that perhaps only Trigorin, oddly both his rival and counterpart, can enjoy equally as much as he escapes to the lake to fish, or at least to fall under the spell of suspended time. The veranda in Act II signifies Arkadina with its manicured lawns that resonate with her coiffed hair “comme il faut.” In her own “civilized” arcadia, to prolong a past that is always idyllic, she would keep Trigorin in tow — and her son and her brother and all the rest. The dining room of Act III is a public way station for private tête-à-têtes that become all the more desperate in a space of crossroads. In Act IV Konstantin’s private study becomes a sickroom, not only for his dying uncle but for himself, neither of them having won what they wanted, the wife and career that completes them. Nina enters that space, symbolically, through a glass door from the dark mystery of the garden, the haunted region of the lake, looking for a haven within the walls that stifle Konstantin. The rustle of the leaves, the lull of woodland birds and chirping crickets — even the buzz of flies and bees, in a sense — should all be heard along with the barking dogs, distant singing, and howling wind. They should be there in idyllic counterpoint to the shot of a gun (which sound designer Jeff Gardner deploys at the right decibel level), because they are vital to the atmosphere but also to the characters’ pregnant silences, which the Samovar cast delivered impeccably, carefully punctuating them. 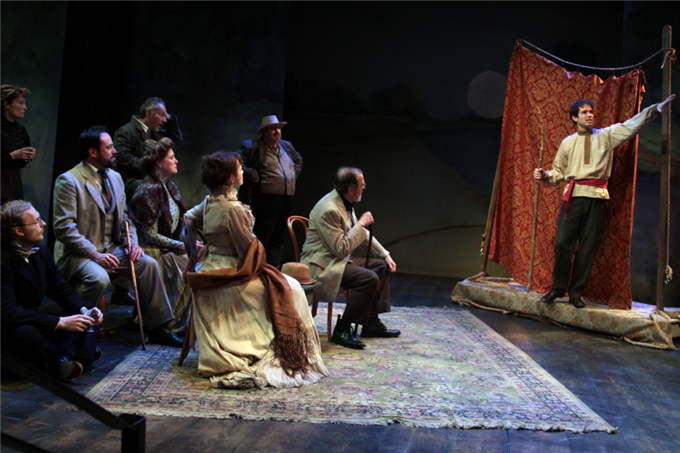 Chekhov’s rhythm in The Seagull hinges on its changing locales, and when the centerpiece oriental carpet fills every “floor” from Act I to Act IV, whether forest ground, croquet lawn, dining hall, or parlor, how to moderate the tone that fluctuates according to the spaces inhabited? 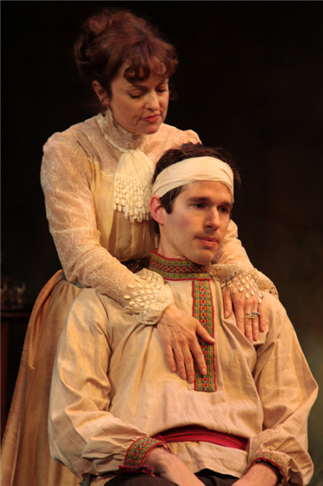 The action for Chekhov doesn’t mount, dramatically speaking, but it moves, as the setting shifts from the emotional turf of one character to that of another. Soliloquies on theatre and literature, flirtations for exchanges on art and fame, trysts for seeking love and life — all rise and fall in stolen moments, each spurred by its special place. Thrice inscribed as a seagull, by each of the play’s writer characters and then by herself, Nina casts it off — “No, not that” — leaving the estate to face her lot in life, to carry on and endure, as Chekhov’s characters do. While the images accompanying this article are of the “Samovars” cast, comments here are on the “Roubles” cast as well, in which some mannerisms invite remarks. Joanna Strapp’s snuff-sniffing as Masha and Laura Wernette’s stomach-smoothing as Arkadina are excessive at times. Masha is clear enough in her plain-spoken self-mourning: “I lug my life around like a dead weight, like an endless train on a gown…” another translator puts it. And Arkadina is sufficiently articulate as a prima donna: “Ah, what can be more boring than this darling rural boredom!” Wernette is an earthy, charming Arkadina if there ever was one, preoccupied with the past but less brittle and shrill than others who play this famed role; yet she lacks Gigi Bermingham's psychological gravitas, regardless of the character's apparent superficiality. 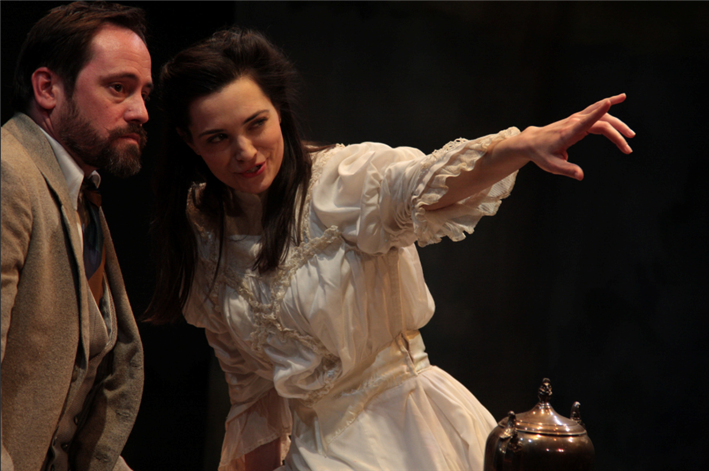 With imagination and verve, Bermingham lets Arkadina's relation with Konstantin be Oedipal, according to Chekhov's own coy references in his play, all the while we laugh at her in dismay. Abby Wilde’s Nina is a feisty seducer, clear-headed and more bent on her pursuit of fame than she is infatuated with it; she is as self-designing a woman as Arkadina might have been in her youth. But Jules Willcox gives Nina depth of field, romantic passion, and a self-possession that is Konstantin's demise. In a translucent and shattering performance, Jules Willcox joins Gigi Bermingham in giving the play its tragic dimension, for all its shimmer and glow. Avery Clyde is equally striking as Masha, bringing the many facets of the character fully to life. With all this female support, Joe Delafield wins our empathy with his deeply depressed Konstantin, fluttering his novice writer's wings frantically like a moth looking for light who can only crash against the surfaces. His soliloquy and all the others, along with Adrian LaTourelle's description of the life of an author, are poignantly expressive of the pains Chekhov took to write. As we listen to these lines, we really care that the playwright chose to write them. When he left his stories for plays, Chekhov surely relished the sound of words on a stage, and he bravely seized their power. 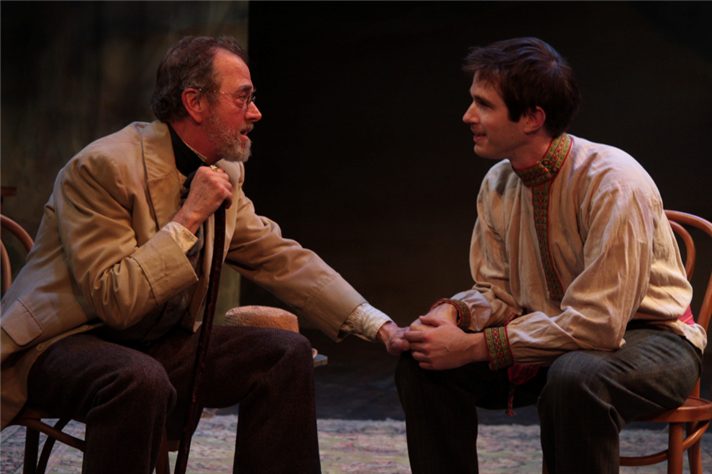 Writer: Anton Chekhov; Director: Andrew Traister; Translation: Paul Schmidt; Scenic Design: Lechetti Design; Costume Design: A. Jeffrey Schoenberg; Lighting Design: Jeremy Pivnick; Sound Design: Jeff Gardner; Property Design: Heather Ho; Stage Manager: Lara Nall. Cast: “Samovars” — Gigi Bermingham, Gregory Itzin, Joe Delafield, Abby Wilde, John Achorn, Dawn Didawick, Avery Clyde, Bo Foxworth, Kurtwood Smith, Bill Brochtrup, Brian Abraham, Janice Kent. “Roubles” — Laura Wernette, Michael McShane, Antonio Jaramillo, Jules Wilcox, Armin Shimerman, Reba Waters, Joanna Strapp, Adrian LaTourelle, James Sutorius, Patrick Wenk-Wolff, Brian Abraham, Bonnie Snyder.